The son of Swiss émigrés, Nilus was a landowner in the government of Orel. He graduated in Law at the University of Moscow and was a magistrate in Transcaucasia. He later moved to Biarritz, living there with his mistress, Natalya Komarovskaya, until his estates were bankrupt. 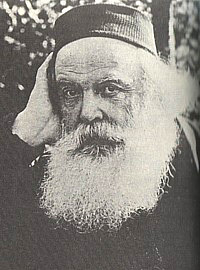 In his younger days a theoretical anarchist with a cult of Nietzche, after his bankruptcy he converted to Orthodox Christianity and returned to Russia where, in 1901 or 1902, he first published Velikoe v Malom (The Great in the Small: The Coming of the Anti-Christ and the Rule of Satan on Earth). This booklet impressed the Grand Duchess Elisabeth Fiodorovna enough for her to introduce Nilus into Tsar Nicholas IIs court. With the fall from influence of the tsars religious counselor, Philippe-Nizeier-Anthelme Vachod (1850 - 1905/08), Nilus was positioned to replace him and arrangements were made to formally enter him in the priesthood and marry him to one of the Tsaritsas ladies-in-waiting, Jelenea Alexandrowna Oserowa [Yelena Alexandrovna Ozerova]. These efforts were blocked by Philippes supporters who publicized a scandal about Nilus' mistress. Philippes eventual successor was Rasputan. Nilus left the court and later married Jelenea. He wandered from monastery to monastery until his wife was granted a pension by the tsar in 1905. This gave Nilus the means to have a second edition of his book published by the government printing office in Tsarkoe Selo, near St. Petersburg. The Protocols of the Elders of Zion, in a slightly shortened form, had first appeared in the St Petersburg newspaper Znamya (the Banner) from 26 August to 7 September 1903. Nilus included the text of the Protocols as an appendix to this edition. Victor E. Marsden, whose English translation of the Protocols continues to be the most popular, claimed that all copies of the edition were destroyed during the Kerensky regime and that the only surviving copy is in the British Museum. The balance of Nilus' life story comes mainly from a biography written by Prince Nikolai Davydovich Zhevakhov in Yugoslavia in 1936. After leaving Moscow, Nilus spent some time at the monastery of Optina Pustyn and then lived on the estates of various friends somewhere in south Russia. Zhevakhov notes that the Bolsheviks briefly imprisoned Nilus in 1924 and 1927. Binjamin W. Segel has him living in Kiev in 1926 where he worked "as a lowly official in the department overseeing foreign religious denominations." Zhevakhov claims that Nilus died of heart failure on New Years Day 1930 although Stephen Eric Bronner has him dieing on 14 January 1929. Jelenea was arrested in the purges of 1937 and deported to the Kola peninsula on the Arctic sea where she died of hunger and cold the following year. Nilus' only son, Sergey Sergeyovich Nilus, presumably by his first wife, later defended his fathers claims and was a vocal Nazi. Bronner notes that Nilus' niece worked for various antisemitic organizations in France, Germany and the United States until her death in 1989. Many unsubstantiated claims have been made about Nilus. Bronner notes that Nilus was often, erroneously, presented as a professor of oriental languages. Gottfried zur Beek [pseud. of Ludwig Müller], who introduced the German edition of the Protocols in 1919, declared Nilus an employee of the Russian secret police (Okhrana). Norman Cohn describes Nilus as "the half-crazy pseudo-mystic" "who in reality was neither a professor nor an orientalist." He does not appear to have officially been made a priest, nor, for all of his time spent in monasteries, to have actually taken orders as a monk. 1. Variously spelt Sergei, Sergey, Sergius, Serge, Sergyei, Aleksandrovich, Alexandrovich. 2. Sources: Armand du Chayla, "Nilus and the Protocols", La Tribune Juive, 14 May 1921; also see Michael Hagemeister, "Sergei Nilus und dei Protokolle der Weisen von Zion", Jahrbuch für Antisemitismusforschung 5. Frankfurt: Campus Verlag, 1992, 133ff; Norman Cohn, Warrant for Genocide, p. 77; Sigmund Livingston, Protocols of the Wise Men of Zion New York : Educational Committee of the B'nai B'rith, 1945, p. 4; Prince Nikolai Davydovich Zhevakhov, Sergei Aleksandrovich Nilus. Yugoslavia, 1936; Stephen Eric Bronner (1949- ), A rumor about the Jews. New York : St. Martins Press, c2000. Selected bibliography: freemasonry.bcy.ca/biography/nilus_s">.